Please join us in welcoming Willy Le to the family! Willy is one of our newest Ambassadors and we are thrilled to have him. 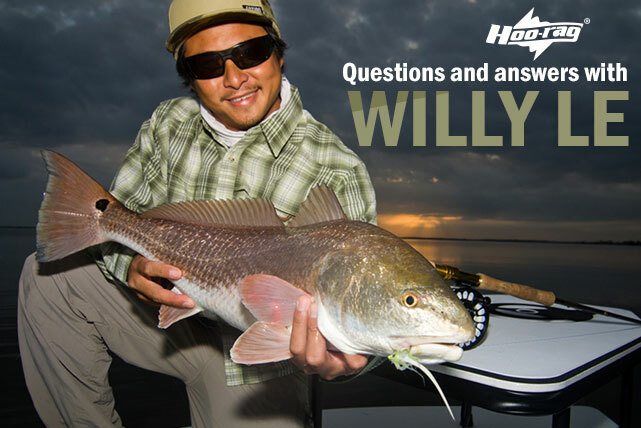 In an effort to get to know him better, we had a sit down with Willy to ask him a few questions. He was such a good sport and stayed up late with us even though he had an early client the following day. You can read the interview in its entirety below. If you are out and about and happen to see Willy, make sure to say ‘Hello!’. For information about booking a charter with Willy, call him at 321-303-7905. You can visit his site at www.nativeflycharters.com. HR: Where do you live now? WL: I live in Cocoa Beach, FL. HR: Where are you originally from? WL: I was born on a little Island in the South Pacific called Guam, but my family is originally from Vietnam. HR: Wow. That is awesome. Did your dad fish and if so did he teach you how to fish? Where did you learn? WL: Actually, it’s my mom that fishes and she taught me everything from catching to cleaning to cooking seafood. She lived off the land and sea growing up in back in Vietnam, and passed on the ways of living a simple life to me and my siblings. Once we moved to Orlando, Florida when I was 1 back in 1980, we would camp out every weekend on the side of the road in Cape Canaveral/Cocoa Beach along the Indian River Lagoon and Banana River. We would fish all day and cook our catch that consisted in fish, clams, and blue crabs. She taught us that you don’t need any money to have a great time, that’s exactly what we did out there, and that’s exactly how I live my life now. HR: What made you want to become a guide? And How long have your been professionally guiding anglers? WL: Going on my 4th year now. I’ve always been fascinated with the ocean and fishing since I was a little grom reading Jacques Cousteau books, it was my dream to fish for a living when I grew up. Once the right opportunity was thrown my way and some words of encouragement from Fly Fishing Legend Flip Pallot, I knew it was my destiny to sign up to get my Captains license. HR: What is your favorite thing about Guiding? WL: Favorite thing about guiding would be watching someone catch their first sight casted redfish whether it be on fly or spin tackle using artificials. Not many people have the opportunity to sight fish tailing reds, so when they first see one tailing, they are pretty fascinated by it. The all around excitement, once that tailing fish eats the fly or lure and comes tight….wow, it’s unexplainable! I’m getting excited just talking about it. HR: What is the funniest thing that ever happened to you while guiding? WL: Funniest thing that ever happened to me while guiding….hmmm. Probably the time when we were idling out to the channel first thing in the morning and a 2lb mullet jumps across the boat and smacks this girl from Ohio in the face then bounces back into the water. Haha. She had never seen a mullet in her life and did not know what had just happened. That woke her up real quick….I was cracking up. HR: What is the worst thing that has ever happened to you while guiding? WL: Worst thing while on a trip is getting stuck in a nasty Thunderstorm that popped up in us in minutes. The tip of the fly rod started buzzing from all the electricity in the air when the client would make a cast so I said “Dude…we gotta go! So we made the run back towards the ramp which was into the storm thinking I can beat it but I was too slow. The storm got stronger and grew bigger! Once we hit the edge of the storm just a mile from the ramp in the middle of the river, our glasses and hats got blown off and the boat did a 180. The chop in the water was a good 2ft+ and I was taking waves over the bow and sides. There was nothing I could do but ride with the waves which was the opposite way of the ramp. Rain was blinding and lighting started crashing every 20-30 seconds all around us. I had my clients put on the life vest and try to keep cool, which they did. In my head I was thinking that we were going to get struck by lightning at any minute. The boat was filled with water and we got blown on the other side of the Indian River. This went on for what felt like hours but really it was maybe 30 minutes until it blew over and we made it back to the ramp safely. When I got home and turned on the news, winds in the area that were we at gusted up to 70mph. I really thought that was going to be the end of my life that day by getting struck by lightning. Someone was definitely watching out for my anglers and me that day. HR: Is there a fish that you caught or put a client on that is most memorable to you? WL: Yes, watching my 5 year old niece Hanna catch her first Largemouth Bass, she was so happy! HR: Did she catch it on live bait or an artificial? WL: Well, first we were catching small bream using bread balls on her Barbie rod, then I look under the dock and see a nice 4-5lb Bass sitting under there. Hanna just caught a small bream and I told her to leave it on the hook and drop it over by the bass. Next thing you know, the bass nails it and we both were screaming with excitement. She reels it in and I grabbed it for her. It was awesome! I have the pictures somewhere. HR: Speaking of tackle preferences – Do you prefer Fly or are you one of those anglers that doesn’t care how it’s done as long as you getting it done? WL: I am definitely NOT a fly snob. I love to catch fish any how, any way. I do love the challenge with the fly rod but I still pick up the spin rod a lot using artificials. O Shootz, one day I’m going to bring back the handline on a beer can. Shootz, maybe soon now that we are talking about it, haha! HR: Where is your favorite place to fish in Florida? WL: It’s gotta be the Florida Keys, world class fishing from inshore to offshore. HR: What time of year do you like being in the Keys and what species are you usually chasing? WL: Every year I go in August for Lobster season with family and friends. I’ve been going down there since I was about 10 or something camping out at first but now we rent a house because the females that come along can’t take the no shower, no a/c, no electricity, and bugs. Most of the time we dive for lobster, spearfish, and reef fish. That is my get away from flats fishing I guess, I just want to relax, have some drinks, and eat what we catch. HR:Is there a species that you feel like you haven’t mastered yet and what is it? WL: Haha I don’t think anyone can really master a species of fish, if so, I wanna meet them and buy them a beer. I don’t think I have any fish mastered at all, some days they eat well, and some days they don’t, it’s fishing! HR: Summer fishing is here, do you have any plans to chase any certain species around the state? out of state? WL: Tarpon with a fly rod. Anywhere in the state. HR: Sounds like you have some specifics in mind. Keep us updated. HR: We are super excited to have you on the Hoorag Team. Which Hoo patterns do you like the best? WL: Thank you for the opportunity, lately I been rocking the plain Hoos and earth tones, it depends on the mood I’m in when I wake up in the morning. HR:Is there a pattern we don’t have you would like to see? WL: Nah, I think Hoo-Rag covers all of the styles…I like more plain natural earth tone colors. HR: Where can people book you for a charter? What is your phone number and web site? HR: When can we get together to fish? WL:Anytime you want brah, you tell me.